Cerdd dafod has been the subject of careful and increasing study since the 18th century when a brilliant group of Welsh amateurs, mainly based in London, began to understand how much Welsh poetic art had changed since the medieval period which, in the field of Welsh poetry, continued to the late 16th century. They soon began to write new poems using the formal structures they could discern in newly collected manuscripts and which were set out in bardic grammars. The brothers Lewis and Richard Morris, owners in turn of the Robert ap Huw manuscript and Edward Jones, Bardd y Brenin (Harpist to the King), were members of this group. They were among the first scholars to recognise the significance of Llyfr Aneirin (The Book of Aneirin). A bard (recaire) and a harper performing before the Chief of the Max Sweynes. Tens of thousands of lines of bardic poetry survive, some in volumes like the 13th c. Book of Aneirin, some in the albums of uchelwyr, the aristocracy who were the poets’ patrons and some written down for the first time during the late-fifteenth and the sixteenth centuries after being transmitted orally by generations of professional bards. The poetry is of great complexity and elaboration and the over-arching poetical theory was known, by the fifteenth century, as ‘The twenty four measures of poetic art’, ‘Y pedwar mesur ar hugain cerdd dafod’. It is likely that the most splendid presentation of a new poem required the poet to rehearse the musicians for the first performance. The musicians were a harpist and/or crwth-player and a specialist singer/reciter of bardic poetry called a datgeiniad. The poet, harpist and crowther gained status from their ability to create original work while the datgeiniad relied on the creative work of others. By the fifteenth century the poets and instrumentalists were organised into craft guilds, the musicians had parallel guild structures to the poets. There was a carefully graded system of attainment and the craftsmen achieved higher grades by demonstrating mastery of a progressively wider and more demanding repertoire, as much a feat of memory as musicianship, and by producing new work. Some poets and musicians were attached permanently to great houses, others lived by making circuits of great houses. The grades attained by the the poets and musicians determined the fees they could charge for their work and possibly the reception they were given at different houses. An eisteddfod was a gathering where musicians and poets could present masterpieces, criticise and acknowledge each other’s work and compete for prizes and honours witnessed by the powerful and cultivated leaders of their society. An element of public examination and the proximity of many creative performers suggests a festive occasion which brought prestige to the patron of an eisteddfod, who might be an aristocrat or powerful clergyman. After the Acts of Union (1536 and 1543) the ancient Welsh legal system of Hywel Dda fell out of use and poets and musicians needed the official warrants awarded at eisteddfodau to avoid being punished as vagrants. 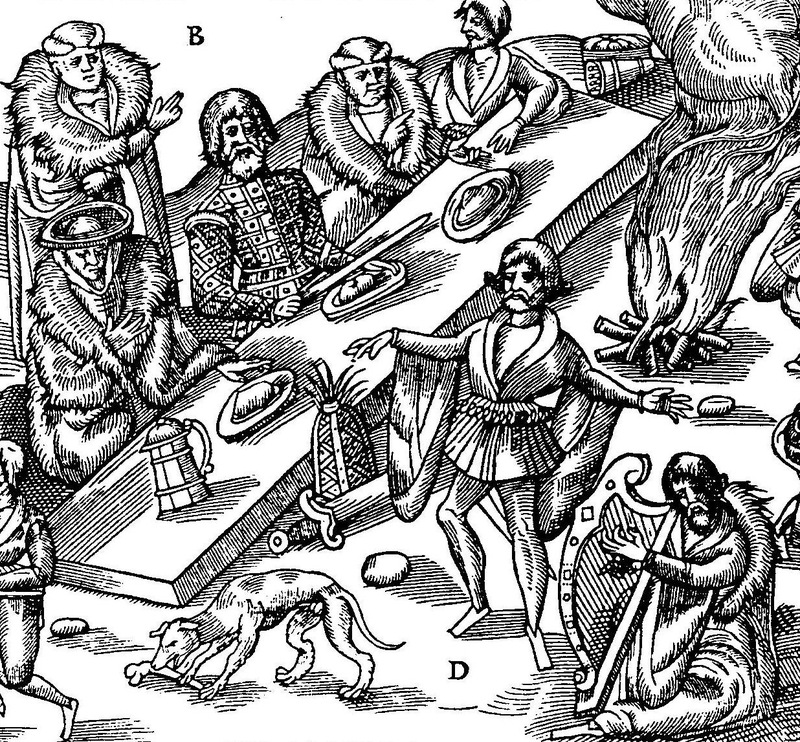 The Salusbury family were involved in organising the eisteddfodau of the late-16th century.